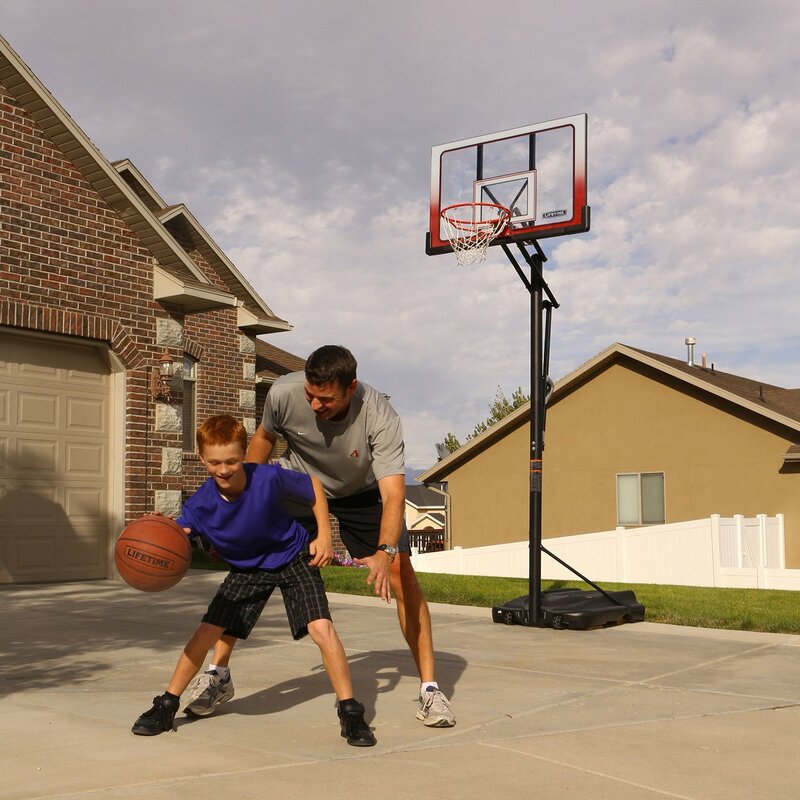 Set up your basketball court where you want with a portable basketball system. 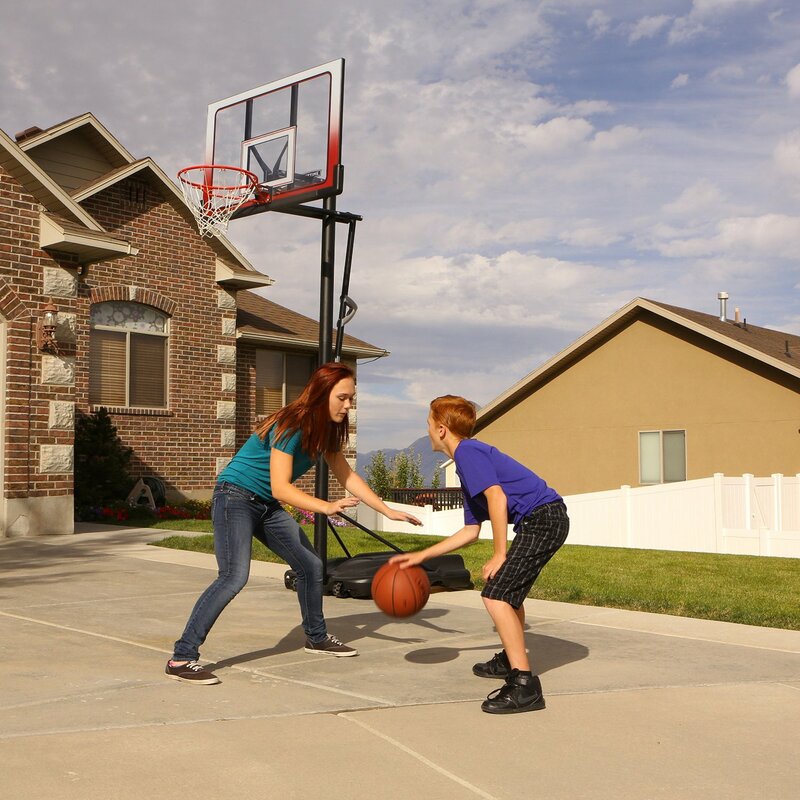 The 1558 Atlas system from Lifetime Products provides you an excellent basketball system to use with your home basketball court. Young players can more easily reach the rim to start developing their shot with the Action Grip height adjuster. This adjuster changes the rim height from 7.5 feet to 10 feet in 6 inch increments. The base has wheels that allow you to roll the system to the desired location. 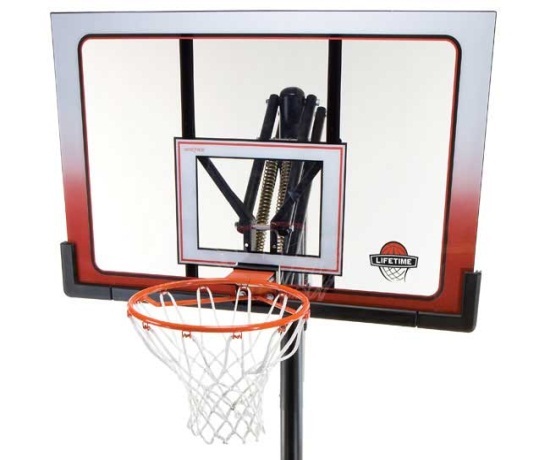 With a large 52 inch backboard, you will have plenty of shooting area to practice your bank shots, great for low post players. 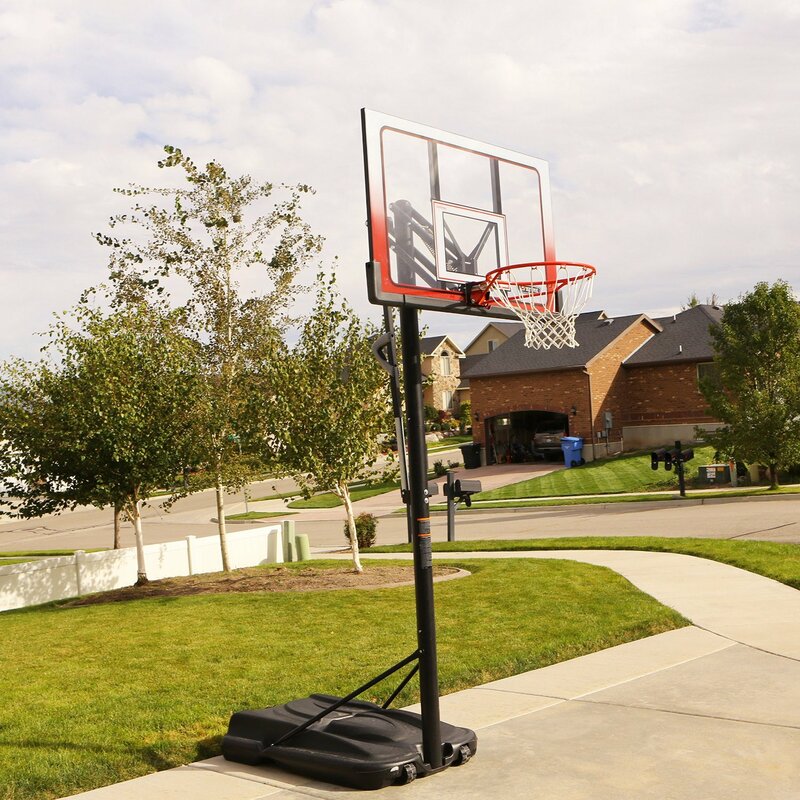 Included with this Lifetime basketball goal is a 5-year factory warranty from Lifetime Products assuring you many years of use. Order your portable basketball hoops here. Backboard material of construction: Makrolon polycarbonate. Polycarbonate is a transparent material. Backboard frame material of construction: powder-coated steel. Backboard frame thickness: 1 inch. Includes a frame pad to help protect players from direct impact on the lower edge of the backboard. Spring-loaded mount helps protect the backboard against damage when dunking. Regulation size, 18 inch diameter. Standard 12 loop net hooks. Includes an all-weather white net. Net hooks are made with welded metal instead of traditional plastic clips. 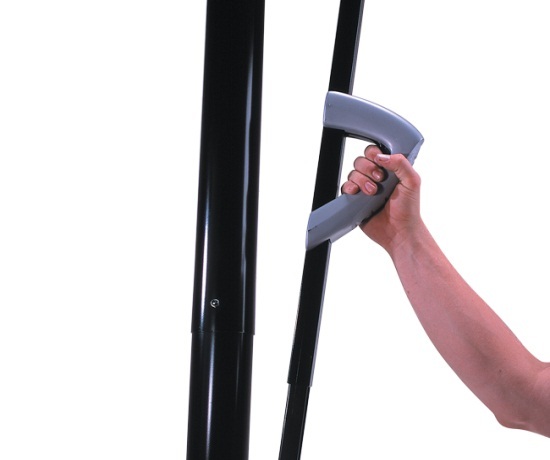 Action Grip height adjuster uses counter-balance springs to raise and lower the backboard. Rim height moves from 7.5 feet to 10 feet in 6 inch increments. Typically needs only one hand to use the device. Pole is 3.5 inch diameter round shape. Pole is made of 3 pieces connected together. Shipping dimensions: 52.5 inches x 34 inches x 10.375 inches. I got no tracking info so call Competitive Edge and they gave me the FedEx tracking # but it did not work either. I got the product in 5-6 days and was well pleased. It take about 3 hours to put together. Craftsmanship and instructions are great. Item was delivered right to my garage door and the box was fully intact. It took about 4 hours to put together by myself and I found the directions to be very clear. The hardware was even packaged in separate packages based on what they were for. The product itself appears to be sturdy after filling the base with sand. My 9 year old son loves playing on it and changing the height is extremely easy. Great product for the price! I found the pricing very competitive and much more of a deal! The free shipping offer was a total deal maker as well. Thank you. Great System for the Money! great basketball hoop. well worth the money. I love the fact that it came with free shipping!!! very easy to put together. good and sturdy,we will get lots of use out of this product. Very happy with this basketball hoop. Our 7 year old can raise and lower it. Sure has a different sound when the ball hits the back board then our old hoop. Very nice. I would also highly recommend ordering from Competitive Edge as we are VERY happy with their costumer service. Q: Is the backboard shatterproof? A: Yes, it is polycarbonate so it is next to impossible to break it unless it's serious vandalism. Q: Do you sell rim to backboard attachment hardware? A: You'll want to call 800-225-3865. Q: My grandson's atlas basketball backboard shattered? it is mounted on a permanent adjusting pole? Do you sell a replacement board that fits the support arms on the adjusting pole? A: You can get a replacement backboard by calling 800-225-3865. Q: How can I get a replacement for the connecting brace that connects the pole to the base that contains the sand or water? One of the braces got bent and now the basketball pole and backboard leans to one side. I could not find any replacement parts on your website. Please inform me when you get this email. A: The pole braces that connect the base to the pole are replaceable by calling 800-225-3865. Feel free to contact us with any other questions. Q: Do you sell just the backboard? I have what looks like the same system as yours with a broken backboard. A: Model 98007 is a compatible backboard and rib combo. If you search for that on our website it will pull it up for you. Feel free to contact us with any other questions. Q: Do you sell parts alone? I need a replacement part, where the adjuster meets the pole and sits in. Q: Are you shipping to Canada? A: We can ship these to some Canadian locations, but not with free shipping. to calculate your shipping cost, please add the item to your cart, and enter your country, province, and Postal code. Due to high shipping charges, most customers prefer to send these larger items to a location near the border on the U.S side, and then pick it up from there. Q: How can I locate a replacement for the counterbalance springs? Q: Bought adjustable goal and plastic backboard is broken how can I get replaced? Q: I would like to know how many inches is the basket? Q: We purchased the Lifetime Atlas Portable Basketball Hoop 1558 from Sam's Club about 5 years ago. Wind blew it over and bent the rim. How much would it be for a replacement rim? It also put a hole in the black portable base so it will not hold water. How much would it be to replace the plastic black base? Thank you for your time. A: For those replacement parts you will need to call 1-800-225-3865. Q: Is there free shipping, I thought there was but can not find the code? A: Although most items on our website have free shipping, this one does not. Add the item to your cart and input your zip code to calculate your shipping cost. We do offer a low price guarantee, so if you find it cheaper elsewhere, we will beat it by $10. Q: Need replacement backboard only. What is price? 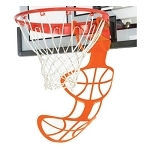 A: The replacement backboard model on our website is 90087 and it is bundled with the rim. If you search our website for model 90087 it will give you the current pricing and availability. Feel free to contact us with any other questions. Q: Do you ship this product to Puerto Rico zip code 00670? A: I'm sorry, but we do not ship these to Puerto Rico. Sorry for the bad news. A: I'm sorry, but we do not ship these to Puerto Rico, our tents are the only ones we can ship outside of the US or Canada. Sorry for the bad news. A: For an older system you will want to call 1-800-225-3865. Q: Your video said 5 year limited warranty. What is the "lifetime for then? So what is the warranty on the "shatterproof backboard? A: Lifetime is the name of the manufacturer the warranty is five years. If you need to file a warranty claim please contact 800-225-3865 and they will assist you. Q: Is the pole 1 piece? A: The pole is a 3-piece Adjustable Pole. A: There is a shipping charge on this particular item. You can view it by adding the item to your cart and then putting in your zip code. If you find a cheaper price elsewhere, just let us know and we will beat it by $10 including shipping. Q: Free shipping or shipping cost G. TX? A: Shipping to G. Texas is 59.99, but there is a special Black Friday Sale added to your cart today. You can view it when you add the item to your cart. If you find a cheaper price elsewhere, we will beat it by $10 and we can also drop the shipping charge, depending on the competitors price. Q: I have a bent rim. How can I replace it? 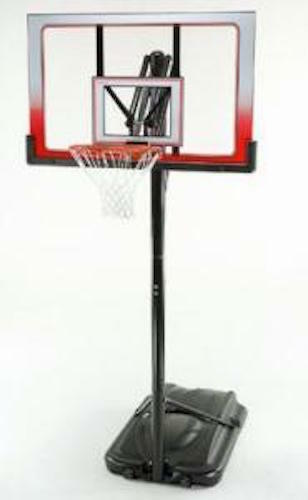 A: The 5820 Lifetime Basketball rim will work as a replacement rim for this basketball system. Q: Is this item the backboard only or the entire portable goal with the backboard? A: This is the entire basketball system. Q: The plastic base has a screw lid - it broke in a wind storm when the unit fell over. Can I purchase a new one ? A: You can get that at 800-225-3865. Feel free to contact us with any other questions. Q: Is their a drain in the portable base? A: The drain hole and the fill hole are the same. Meaning if you need to empty it you would need to tip it on its' side. Q: how much sand do you need to fill the base ? A: The portable base holds 35 gallons of either water or sand. If you do not intend to move it much, I would recommend filling the base to the brim with sand. However, if you do want to move it often I would recommend water, which can be easily drained or added for easy movement. You do not need to fill it all the way, just note that the more you fill it, the more stable it will be. Q: What would it cost to ship to Houston, Texas, and how long would it take? Do you take a Canadian Visa, and since I am paying 30% additionally is there any chance of a break in price? A: At the time of this comment the shipping is a flat rate in the United States of $59.99. We accept most forms of payment. Feel free to contact us with any other questions. Q: We bent the hoop so I need to replace the hoop, where can I get this? A: We sell replacement rims and systems. You may call our customer service department at 801-732-0601 to discuss. Q: How can I get replacement for my backboard or Repairs done? A: The replacement model that we carry is number 90087. It is the same size and is completely compatible with model 1558 as a replacement backboard. Q: How high can you extend this court in terms of height? A: The rim goes up to regulation height of 10' and down to 7.5'. Q: Is it possible to replace just the backboard? Ours shattered. 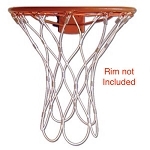 A: We sell backboard and rim combos, but not just the backboard alone. Any of the lifetime brand backboard and rim combos would be compatible your basketball system. You can choose any size of backboard from 44 inches up to 54 inches. You currently have a 52 inch backboard. 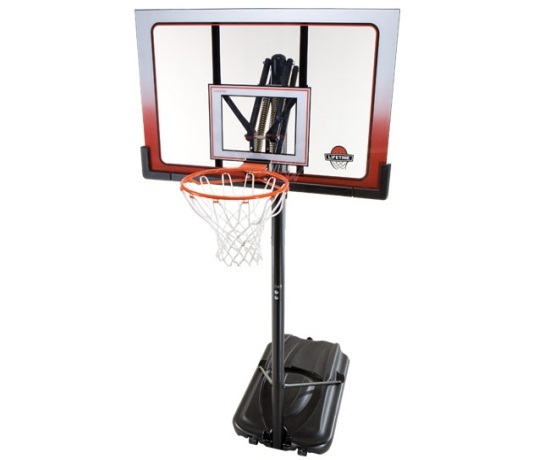 Model 90087 is a 52 inch backboard and rim combo. 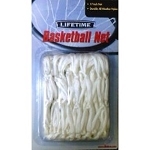 To view them simply click on the sporting goods category and then click on basketball. Q: How do I level the base of his basketball system if it is not on a level playing surface? A: The older models had a slight collar where you could try and level it by adjusting the collar. They don't make those anymore. Your only option with this model is to create a level surface by using sand, dirt, or creating a wooden base or something similar. Q: What's the height of it? A: The regulation height for a basketball system is 10 feet. This goes up to 10 feet and down to 7 1/2 feet. The backboard itself is about 30 inches high so that makes it about 12 1/2" at the highest point. 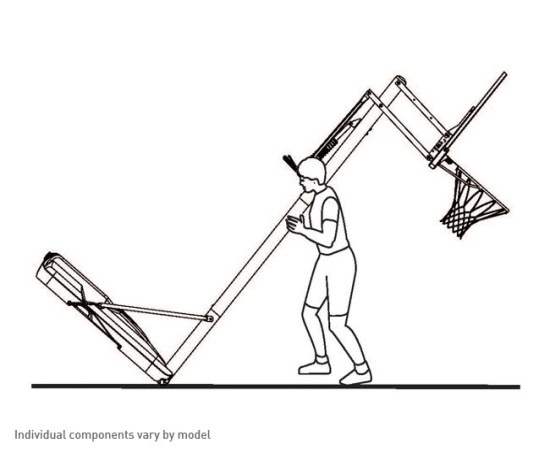 Q: What is the difference between the 1558 Atlas basketball goal and the 90176 basketball systems? A: These two systems are almost entirely identical. The only difference is the graphic on the backboards. All other parts - backboard size, materials, features, dimensions - are identical. 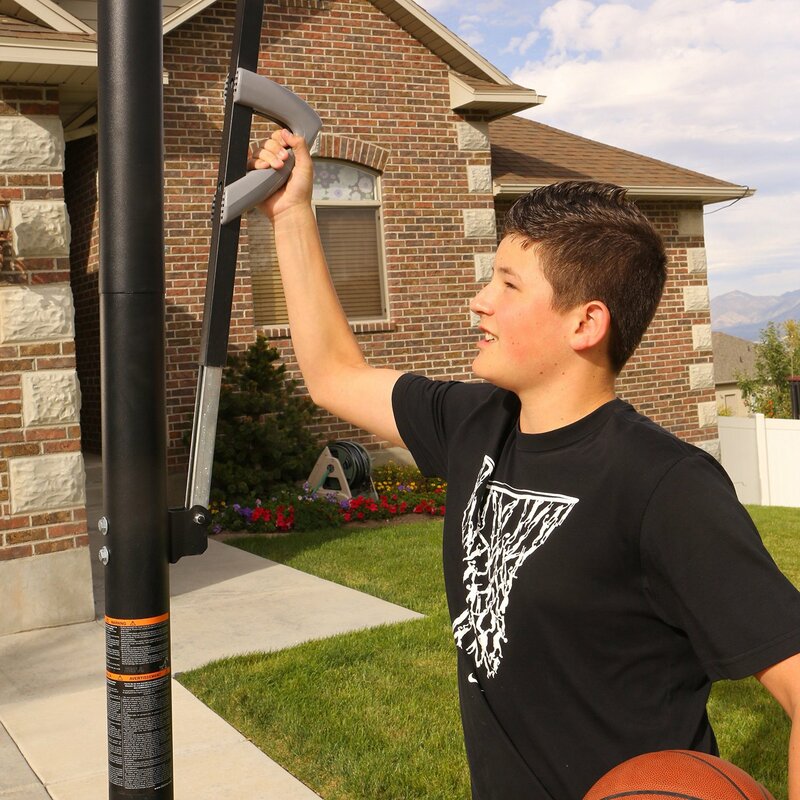 Q: Can I replace the backboard on my Atlas basketball system? A: Yes. 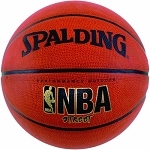 The Atlas basketball equipment system is made by Lifetime Products. 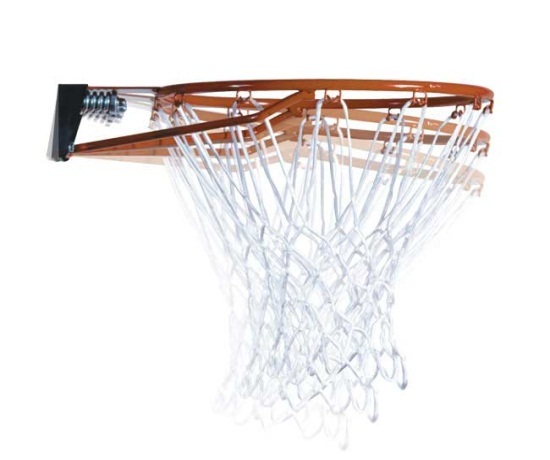 The bracket used to mount the backboard is compatible with any of our Lifetime backboard and rim combos. Contact us with any questions. Fast Shipping: Orders for the 1558 Lifetime Portable System generally leave the warehouse the next business day. Dimensions: 53" x 34" x 10"